Indirect immunofluorescence assay and confocal microscopy to localize the selected excretory-secretory antigens by coimmunostaining of P. falciparum-infected erythrocytes. Air-dried infected erythrocytes were incubated with mouse antibodies specific to the selected proteins at 1:100 dilution (column 4; red). Rabbit aPfMIF antibody was used as a co-localization marker (column 3; green). The parasite nuclei were stained with 4’,6-diamidino-2-phenylindole (DAPI) (column 2; blue). Columns 1, 5, and 6 show a differential interference contrast (DIC) image, merged image, and differential interference contrast with merged image, respectively. Images showed punctate vesicle-like staining of the infected RBCs with antibodies to PfSEL1 (PFB0190c), PfSEL2 (Hrd3), PfEKand PfEP. PfEK also showing specific rimlike staining of the plasma membrane of the infected RBC. PfMIF is exported via the Maurer clefts to the extracellular medium after schizont rupture. A partial co-localization of PfMIF was seen with each of the four proteins, suggesting a distinct pathway for the release of these ESAs.Singh M, Mukherjee P, Narayanasamy K, Arora R, Sen SD, Gupta S, Natarajan K, Malhotra P. Proteome analysis of Plasmodium falciparum extracellular secretory antigens at asexual blood stages reveals a cohort of proteins with possible roles in immune modulation and signaling. Mol Cell Proteomics. 2009 8(9):2102-18. Localization of Plasmodium falciparum macrophage-migration inhibitory factor (PfMIF) in blood-stage parasites. 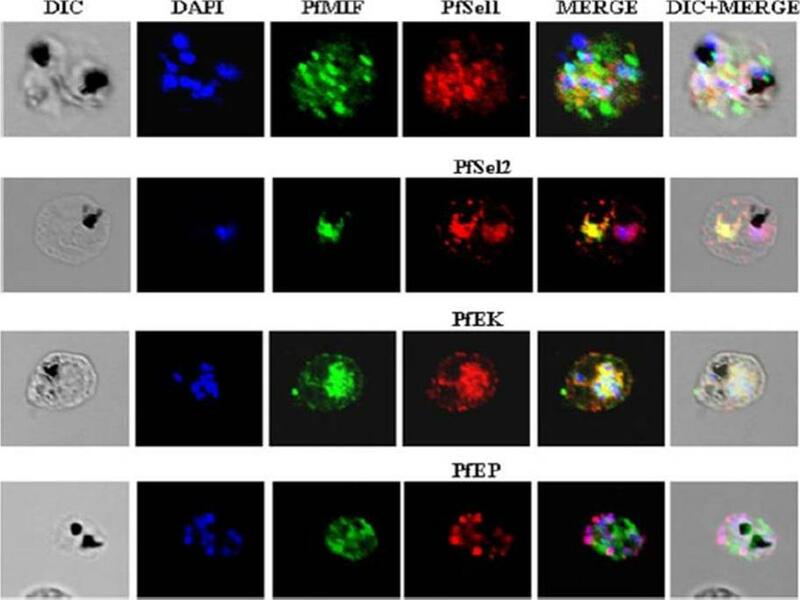 Tightly synchronized parasites at different stages were stained with 4-6-diamidino-2-phenylindole (DAPI) to identify infected red blood cells (iRBCs), with P. falciparum skeleton bindingprotein 1 (PfSBP1) antiserum to indicate the iRBC cytosol, and with anti–PfMIF peptide IgG to determine their localization within iRBCs. The arrows in the bright-field micrographs indicate iRBCs. In ring-stage parasites, PfMIF was almost exclusively located within the parasite. However, as the parasites developed into trophozoites, PfMIF was clearly detected in both the parasite and the iRBC cytosol. Copyright Oxford University Press 2011.Cordery DV, Kishore U, Kyes S, Shafi MJ, Watkins KR, Williams TN, Marsh K, Urban BC. 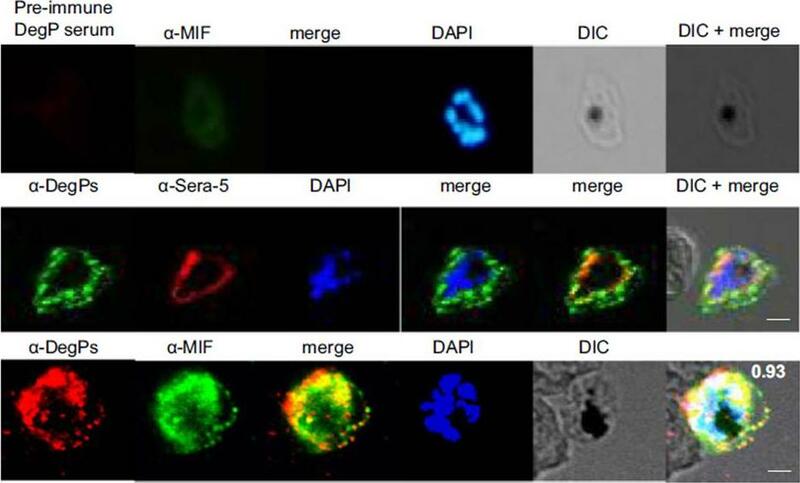 Characterization of a Plasmodium falciparum macrophage-migration inhibitory factor homologue. J Infect Dis. 2007 195:905-12.